Posted February 22nd, 2019 & filed under Sealcon News, Thread Adapters, Enlargers, Reducers. We offer all components of cable management solutions. In addition to cable glands, enclosures, and conduit, we also offer hundreds of accessories to complete any project. One our most popular accessories are our thread adapters available in either nylon or nickel plated brass. If you have components that don’t match up due to having different threads, use one of our adapters to convert to metric, PG, or NPT threads. If the size of the thread happens to be the problem we also offer enlargers and reducers. These products allow you to use the parts you currently have and is more cost effective than purchasing new equipment. Another one of our popular accessories is our extensive range of O-Rings. Our O-Rings come in three different materials including Buna-N, Silicone, and FKM. Silicone O-Rings are best suited for extreme temperatures with an operating range of -76°F to 482°F. FKM have an operating temperature range of -31°F to 302°F and are resistant to some acids, alcohols, halogens, and more. We have many more cable management accessories to offer. We also offer seal rings, dome plugs, hex plugs, cable clamps, and locking nuts. To learn more about our accessories, click here to be taken directly to our accessories page. Posted December 3rd, 2018 & filed under Circular Connectors, Sealcon News. With the development of technology improving every day you want to ensure that data is being collected and transmitted quickly and reliably. Our M12 signal cordsets offer unparalleled connectivity along with the advantage of data and communication flow in a wide array of industrial applications. They are well-suited for applications in which a compact, dependable connection system is needed such as automotive production, machine fabrication, printing presses, rubber and plastics development, textile production, conveyors, automation, and many other manufacturing applications. The compact size of the M12 cordsets make them the ideal choice for cramped and complex applications such as encoders and motors. All of our M12’s are available with male, female, or flying lead ends as well as straight and right angle housings. Multiple cable lengths are available as well. Our M12 Signal cordset is available in either A, B, or D codings with pin-outs of 3, 4, 5, 6, and 8 positions. To learn more about our M12 Signal cordsets, visit our website at www.sealconusa.com or call one of our technical sales staff. Posted October 16th, 2018 & filed under Sealcon News. In dynamic applications, you want components that are both durable and don’t take up a lot of space. This is especially true for industries such as robotics, railways, and automation. For these applications we recommend using our PoE M23 circular connectors. These hybrid connectors offer Ethernet transmission up to a one gigabyte range (Cat7) as well as either a power or signal transmission. What would normally be done by two separate connectors can now be done with one, saving space and costs. The M23 PoE circular connectors are available with up to five individual EMI shielded circuits, guaranteeing safe data transmission. In addition, the connecting components are HF – technically matched to an impedance of 100 Ohm which eliminates cross – talking. As standard RJ45 lines are wearing out and becoming more unreliable you want to ensure that they are replaced with products that are dependable and capable of handling high transmission speeds. These PoE connectors are available in either a straight or right angle housing or as a panel mount. If you would like to find out more information on our POE M23 circular connectors, click here or call one of our technical sales staff. Posted August 14th, 2018 & filed under Sealcon News. Sealcon is proud to be showcasing our products at the IMTS convention this year. With over 2,000 exhibiting companies, IMTS is America’s largest premier manufacturing show. 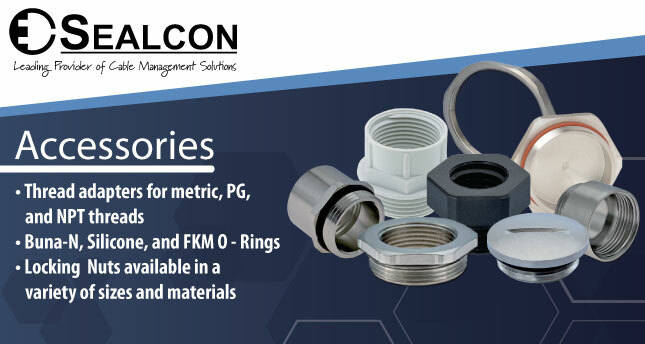 We will be showcasing our M8-M40 circular connector collection as well as our extensive selection of strain relief fittings. If you are attending the show, please stop by and see our products first hand. Our booth number is #134892, located in the east building on level 3 of the McCormick Place Convention Center. The show is located at 2301 S. Lake Shore Dr. Chicago, IL 6MTS0616 USA. I runs from 9:00 am to 5:00 pm Monday, September 10th through Saturday, September 15th. Posted July 13th, 2018 & filed under Circular Connectors, Sealcon News. Circular connectors have become the “go to” solution for automation systems because of their benefits over hardwired systems. Circular connectors are easy to use, compact in size, extremely adaptable, and rugged enough for outdoor use. One of the most popular circular connectors that we have to offer is our robust M23 connectors. Our M23s are highly customizable and available with both power and signal inserts. We offer three different contact options including crimp, solder, and dip solder. The possible pin-outs for the M23 power are 6, 8, 9, and 10 poles while the signal pin-outs include 6, 7, 9, 12, 16, 17, and 19 poles. The M23 is a0vailable in a variety of housings including straight connectors, right angle connectors, and panel mounts. In addition to the standard screw connection, the M23 is also available with the TWILOCK or TWILOCK-S quick connect system. M23s are suitable for a variety of applications including motors, encoders, motion controls, robotics, and conveyors. The connector can be used in temperatures ranging from -40 °F to 257 °F allowing it to be used in a multitude of demanding environments. We also offer a stainless steel housing for the M23 allowing it to be used in hygienic applications as well as outdoors. To find out more information about the M23 power circular connector, visit our website or call one of our trained technical sales staff. Posted June 25th, 2018 & filed under Circular Connectors, Enclosures Industrial, Sealcon News, Strain Relief Fittings. Solar and other alternative energies are efficient, reliable, and have been adopted around the world as a source of clean and affordable energy. In such a large and expanding industry, you want to make sure that every piece of equipment can withstand the harsh conditions of the outdoors. Sealcon offers a variety of products that are resistant to both UV-exposure and extreme temperatures making them an ideal component for wind and solar energy. All of our black nylon cable glands are ULF1 approved and are available in multiple sizes and thread types. If you need a product that is more durable than nylon all of our metal strain relief can be used outdoors. Our metal cable glands come in both nickel plated brass and stainless steel so you can pick an option that is right for you. In addition to our cable glands Sealcon offers a number of other products that are suitable for outdoor use. We have conduit, circular connectors, and enclosures that are able to be used in outdoor applications. If you have any questions about which of our products can be used outdoors, feel free to visit the Sealcon website or call one of our technical sales representatives today! Posted June 7th, 2018 & filed under Circular Connectors, Sealcon News. In the food and beverage industries you want to make sure that your products avoid contamination at all costs. Microorganisms and dirty equipment can lead to unwanted impurities which can harm the health of your consumers and your business. Sealcon offers a large number of products that meet the hygienic requirements of the food and beverage industry. Stainless steel is the ideal material for food processing applications because it is easy to clean, non-corrosive, and lacks pores where microorganisms can survive and reproduce. We offer a wide selection of stainless steel fittings including cable glands, locking nuts, and thread adapters to meet your cleanliness demands. We have two products that have been specifically designed for food safety. Our RG (IP 68 & IP 69K) and FP (IP 68) hygienic cable glands are made up of 100% FDA compliant materials. Their smooth stainless steel shells are liquid tight and are made for easy spray cleaning. The RG gland is suited for high pressure water cleaning while the FP gland is suited for foam cleaning. The shells of the hygienic glands are completely free of nooks and crannies were deposits of bacteria can grow. If you would like to learn more about our stainless steel fittings or hygienic glands click here or call one of our technical sales staff today! Posted May 17th, 2018 & filed under Circular Connectors, Sealcon News. The M23 TWILOCK – S is the most versatile circular connector that we have to offer. It has the same functions as our normal M23 connector with it our TWILOCK – S quick connect locking system. This connector is much faster to install than the standard M23 screw connection, a ¼ twist is all that is needed to connect or disconnect. Two different housing options are available including a straight housing and a right angle panel mount. The connectors come in either signal or power and there are multiple termination choices including crimp, solder, dip solder, and screw terminations. In addition to being compatible with the rest of our modular M23 connectors, the TWILOCK – S is the only connector on the market that is intermateable with Speedtec® by Intercontec/Tyco. To learn more about our M23 TWILOCK – S Connector, visit us at http://sealconusa.com/ or call one of our technical sales staff. Posted May 3rd, 2018 & filed under Circular Connectors, Sealcon News. Sealcon’s M23 circular connectors are the robust connectors that you’ve been searching for. The M23s are available with either power or signal inserts and are compact enough to fit into nearly any environment. Our M23s are built to the highest standards, earning them a pressure rating of IP 67 / IP 69. The durability of the connectors, coupled with their compact size, make them an ideal for a wide variety of industries including automation, manufacturing, packaging, motors, and machine building. We offer three different housing options including a straight housing, a panel mount, and a right angle panel mount. There are also three different locking mechanisms to choose from including the standard screw connection, TWILOCK, and TWILOCK-S. The TWILOCK connector is a simple ¼ twist connection allowing for quick and painless installation. Our TWILOCK-S connector is our most versatile connector because it is the only M23 connector on the market that is intermateable to Speedtec® by Intercontec. To learn more about our M23 circular connectors or about any of our other connectors, contact us today either over the phone or visit us at www.SealconUSA.com.